One of the links in a prehistoric route, often called the Greater Ridgeway, from The Wash to the South Devon Coast. From the Ridgeway at Ivinghoe Beacon and using green lanes, farm and forestry tracks the route follows the group of prehistoric trackways which form the Icknield Way along the chalk spine from the Chilterns to Norfolk. Many sights of archaeological interest are passed on the route through Dunstable, Baldock, Royston, Great Chesterford and Icklingham meeting the Peddars Way at Knettishall Heath. 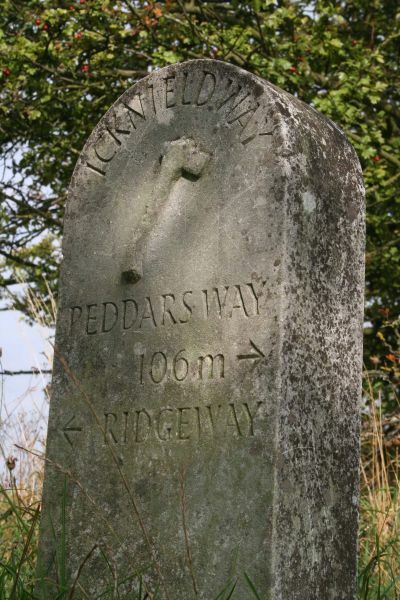 The Icknield Way Association Walkers Guide includes details of a link to Thetford from West Stow and an alternative route through Toddington. Walkers using this route should also carry the relevant maps. The waymarked Icknield Way - Ridgeway Link (7.5 miles and coincident with the Icknield Way Path on OS mapping) is a linking route from the Chilterns Gateway Centre on Dunstable Downs to the finish of The Ridgeway National Trail at Ivinghoe Beacon where there are no visitor facilities. The Link uses the route of the existing Icknield Way Path that has been upgraded to make it is stile-free and steps have been added on a steep section.